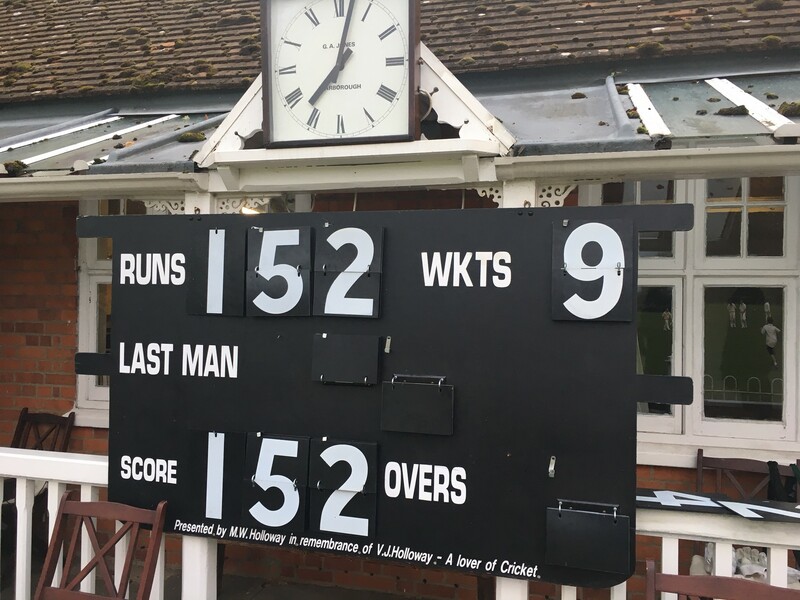 A team of committee members, core players and guests turned up at the picturesque ground of Warborough and Shillingford in anticipation of good cricket and bad rain. Both were on show. Will Metcalfe, stand in captain, lost the toss and we took the field with eight players. This was shortly boosted to the full eleven after a couple of overs. Rob Rydon and Will Noble settled into a long and steady opening spell utilising the variable bounce of the pitch. A couple of wickets fell as the W&S batsmen found it difficult to penetrate the field and even when they did, it got held up in the wet grass. Warwick Okines came on to bowl his leggies (having last turned his arm over in the corresponding fixture last September) and soon settled into a steady rhythm and enticed a catch, cleanly pouched by young Ollie Robertson. Lunch was taken but not as cleanly. A slight delay with the chicken curry from the pub, meant that a very fine Merlot was heartily sampled. This was later topped off with cheese and port, all sitting under the oak tree. The buffet was continued as Archie Walker bowled an over of pies, snaffling their top gun with a full toss down the leg side safely taken by Rob at backward square leg. Neil Robertson claimed some credit as he had been plying the batsman with red wine during lunch. Warwick continued his guile and was joined by Chris Leech with some fine part time left arm spin. The shock of the day was Neil taking a catch off his toes at long on. Normal service was resumed later as he shelled a regulation catch at mid on. Alan Tilley, the 74 year old stalwart of W&S, belied his years as he started to dispatch balls to the boundary and run some twos (a lot quicker than some twenty years younger than him). Alex Rydon came on to bowl some tweakers to good effect and ended up with more wickets than his dad, but it was left to the captain to make another good decision to bring back Will Noble and himself to polish off the tail. 152 all out and while we got gently damp, only one break for rain. It was going to be tricky chasing that down with probably thirty overs to be bowled. Chris and Ollie set off but soon decided they would rather be in the pavilion where it was drier. Archie and Jim Harcourt employed the same tactics and Neil, after hitting a few lusty boundaries fell on the stroke of tea. 32 for five was not particularly enticing, but the tea was. Generous fillings in a selection of sandwiches, clotted cream on the scones, millionaire’s shortbread. Plus the fact that it was hosing it down outside all put us in an end of term mood. While some started to change out of their whites, the rain abated and so we went back out there. Alex chipped one to extra cover and Rob joined Will Noble, resplendent in his MCC sweater and dark blue scarf. A few lusty blows and things started to look a bit more encouraging for the Buccaneers. Good running and a bit of panic in the field all helped. Sadly Will fell for 26 and Rob was joined by Will Metcalfe, who carried on with the scampering. 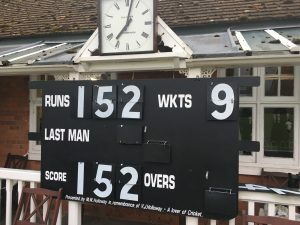 As Will died by the sword and David Close entered the fray, 29 were needed off the last three overs, with eight wickets down. The skipper, God bless him, told the old lags to go for it or die trying. Spirits were lifted as Rob flew a few sixes over fine leg and took 17 off the over. Some leg byes, edges and general mayhem ended up with Rob needing two off the last ball. A hit to extra cover was going to test his speed and he was found wanting as the throw to the keeper beat him back. A draw, but the most exciting kind and all was sweetness and light in the Six Bells as we toasted cricket being the winner*. *Buccs also secured a draw with scores level against W&S in 2006. Both sides scored 235-8. Note J Harcourt (18) and D Close (61) played in both games.